Ringside boots presents the all new union 'mixed colour' cambrelle boxing boot finished with red strips and red & blue suede trim. Boot is lace up front as seen in the image to the left of your screen. Finished with the ringside boots rear logo and based on an original boxing boot design by 'ringside boots' managing director richard bishop in association with RB Footwear since 1969. Buy quality Buy British and buy from the company who have made for just about every world champion in the last three decades. No middleman no far east manufacturing British and direct from the factory at competitive prices. Performance tested ringside sole made from grizzle compound rubber with new EVA lift for extra give. 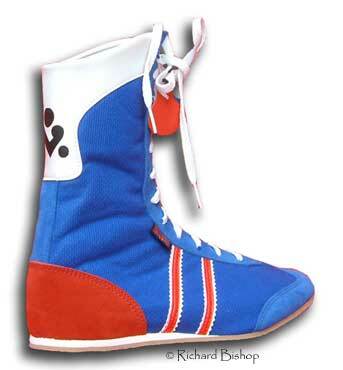 As used in world title fights by boots designed by RB Footwear.